Traditional dance meets its contemporary versions at a celebration aimed to mix the norms of movement and create from the new steps that will be followed by dozens of dancers from cultural associations at the Opening Ceremony, in a dance inspired by the spiral depicted in Medal of Giortes Rokkas. 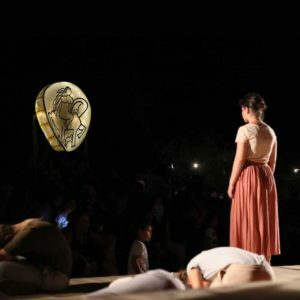 Creations from the Percussion and Lanterns workshops, where the participants will have the opportunity to experience two new arts and learn their secrets, will accompany the show, creating an unforgettable spectacle. Rokka and Kera villages are located in the northwest of the Prefecture of Chania, in the Municipality of Kissamos, 12 km from Kissamos, 39 km from Chania and 55 km from Chania airport. Following the E65 National Road from Chania to Kissamos, and turning to the Nopigia to Kera – Rokka hub, you will not have difficulty finding us. Giortes Rokkas area in Kera is located next to the church in the center of the village, on the main road from which you will come.